Hello and goodbye. Some budgies are just born lucky. My name is Veda and I`m a lucky boy budgie. Or maybe I`m just getting what every bird deserves. 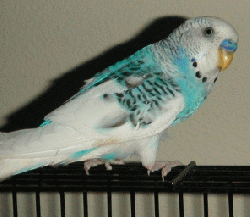 I was surrendered to an animal shelter with 4 other standard budgies, 2 English budgies, 2 cockatiels, 2 lovebirds, and 8 rabbits. Everyone else was healthy, but I had been injured and had to be rushed to a vet. The person who responded to the call for help was a wonderful Mickaboo volunteer. She picked me up, took me to the vet, and when I was well, she took me home. Then she discovered what a good fit I was for her family, and decided I could stay. Every Mickaboo bird deserves a good home. Some of us are lucky and find ours right away.